We are cheese lovers in our home. Hard or soft, as long as it is cheese, we'll devour it. And that can play havoc with my grocery budget. 1.I buy blocks of tasty cheese ($6/kg at Aldi) and grate them to use on pizzas, pasta bakes, potato casserole etc. Grated cheese freezes beautifully and can be used straight from the freezer for casserole toppings. 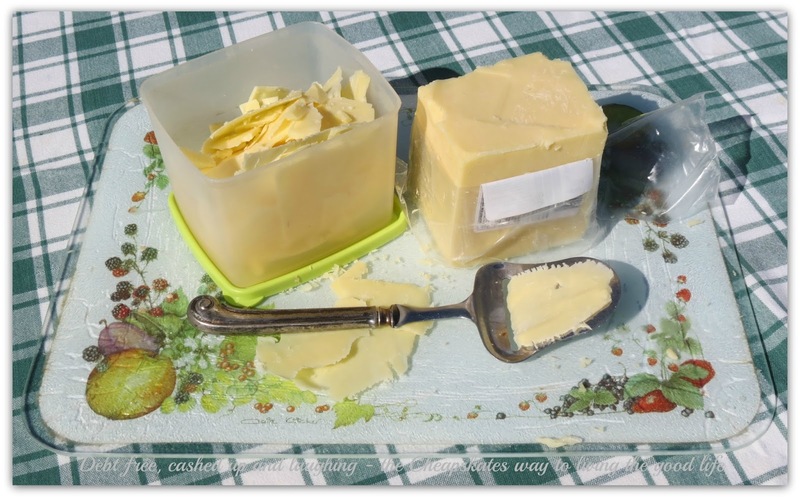 To stop the cheese shards sticking together when they are frozen add a teaspoon of corn flour per cup of cheese when you pack it into containers or bags. Shake it up to coat the cheese and you won't have a problem with clumped, hard lumps of cheese again. 2.I make mozzarella, ricotta and feta. Fresh mozzarella grated in slivers over hot pasta is divine. These are three of the easiest cheeses to make and they are so versatile. Ricotta can be used in dips and cheesecakes or as a spread on bread instead of butter. Feta is delicious on its own and in salads. 3.I buy blocks of the more expensive aged hard cheeses when they are on sale and use my trusty cheese slicer to slice them. This is the biggest cheese cost saver for my family. I never buy sliced cheese. The slices are always much thicker than what I slice myself and at twice the price of a block of the same weight I feel it's money I could use for something else. Slicing the cheese myself and storing it in a Tupperware container. 4.I portion the cheese out. That means when I do my monthly grocery shopping and buy cheese for the month, it is packed into weekly portions and frozen. I take one portion a week out of the freezer and put it in the fridge to use for cooking, sandwiches, salads, snacks and so on. When it's gone, it's gone. I don't get any more out until the next week. We've learnt over the years to make our cheese last or go without. We get to enjoy the cheeses we like without blowing my grocery budget. Is cheese a big expense for your family? How do you make it last? Or do you just absorb the cost and buy more when it's all gone? Sounds fun as well as healthy, but where did you get your citric acid and rennet from? Most places I have found, so far, are online and charge an arm and a leg for postage! You'll find citric acid in the baking aisle of the supermarket but it will be expensive. Try a good health food shop or a bulk wholefoods store. Rennet - use plain junket tablets. You may find those in the dessert aisle of Coles or Woolworths; IGA do stock junket tablets. Junket is simply the tablet form of rennet. They are coming, along with photos. It's simple - after slicing the cheese is portioned out and stored in containers with their names on it. When they were small it was easy as I was in charge. Now everyone has their own container and their own portion and if they choose to devour it or save it is up to them. Grated cheese is off limits, it is for cooking only.